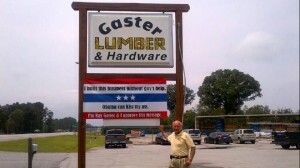 Gaster’s response: signs hung prominently outside his three storefronts declaring that he built the business without any help from the government. Obama isn’t saying that everyone needs direct and explicit government help to start a business (e.g., with borrowed government funding), but rather that surrounding every business is a system of infrastructure, laws, and commerce that makes the endeavor possible. The government built the roads carrying customers and merchandise, laid the wires that carry electricity and communications, established the police and fire departments that protect the building and its occupants from theft and disaster, and developed the civil justice system that provides recourse against fraud. 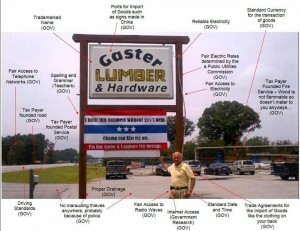 Critics of this image suggest the fallacy is that these things are all funded with taxpayer dollars, so it’s ultimately still the business owner paying for all of it. The trouble is that no one person’s tax dollars could fully fund all the services from street lights to sewer lines the government currently provides. Just hiring enough police officers to provide protection around the clock would use up every dollar I’ve paid in the past several years. But private police forces are at least theoretically possible. (We could have a system where only people who have paid for police protection receive it.) Other government-run services are impossible to separate in that way. I could, for example, pay for the construction and maintenance of the roadway in front of my house, but that road is only valuable to me when it’s linked to other roads leading elsewhere in the city. If my neighbors don’t care about roads, how could I get across town? Two years ago, Colorado Springs turned off its street lights, inviting residents who wanted the lamps relit to write a check to cover the cost of their lamp’s electricity. And while I’d be happy to pay for the electricity to the lamp outside my house, I like that when I go running in my neighborhood at night, every lamp is lit. Ultimately the disconnect here is understanding the difference between what our government officials do and what government does. Maybe your roads are crumbling, your mayor is a crook, and your governor has been embezzling tax dollars for years — and there’s no excusing any of that. But their failures don’t eliminate the need to have a government of some kind. There are some things we just can’t do on our own: like building a business.